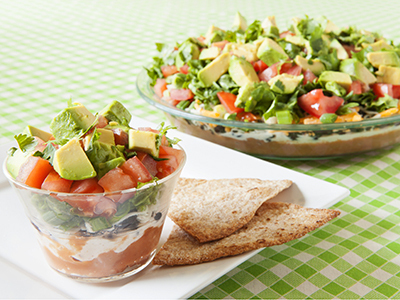 A snap to prepare, this favorite party recipe is sure to go quickly! 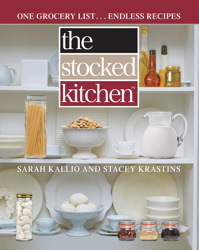 From The Stocked Kitchen: One Grocery List…Endless Recipes. 1. Mash the black beans and mix with the cream cheese and salsa until well blended. 2. Spread over the bottom of a pie plate. Layer with the lettuce, Cheddar, green onions, and olives. The Stocked Kitchen™ is the first complete meal creation system with only one standard list of groceries. If your kitchen is "Stocked" with these ingredients you will always have what you need to create any of the 300 delicious recipes found in this book. These recipes have been used for all of the authors' own dining needs, including meals for drop-in guests, special occasions, and every-night family dinners. Sarah Kallio grew up in Mt. Pleasant, Michigan, and graduated from Michigan State University. She currently lives in Grand Haven, MI. She is a wife and mother of two gorgeous girls and is a tenacious redhead who loves to laugh. Along with sometimes being a bit scattered, she is filled with creativity and passion.